When comfort meets style, you know you’re in for a great wearing experience. But when comfort and style meet durability and protection, as they do in these Wrangler Women's Crosshatch FRW10CH Flame Resistant Work Jeans, you're in for something special. These w ... (see full details) (see specifications) #FRW10CH. When comfort meets style, you know you’re in for a great wearing experience. But when comfort and style meet durability and protection, as they do in these Wrangler Women's Crosshatch FRW10CH Flame Resistant Work Jeans, you're in for something special. These women's denim pants are built to last and offer flame-resistant protection. They meet NFPA 2112 requirements and NFPA 70E, ASTM 1506 and OSHA Rule 1910.269 standards. They're rated HRC2, ATPV 20.0 calories/cm2. Best of all, they're Wranglers, and you can trust that they will keep you guarded in the presence of fire hazards. These sturdy work pants for women are comfortable, there's no doubt about it. They have the familiar feeling of blue jeans because they're made from 13.75-ounce 100% cotton denim. The mid-rise sits just below the waist for a comfortable fit that suits most all body types. In addition to a fit you'll love, these women's flame-resistant jeans have a look that's just right. They feature a bootcut leg opening that's both practical and stylish. It looks great and is perfect for wearing with your work boots. Classic 5-pocket styling features two hip patch pockets detailed with embroidery for some extra pizzaz. No matter what your workday brings, these Wrangler Women's Crosshatch FRW10CH Flame Resistant Work Jeans deliver protection, comfort, durability, and style. Order yours today from the FR workwear experts at Working Person's Store! You folks are great. I'm staying with Working Person's Store with this kind of service! 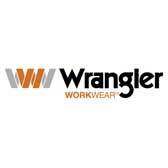 Wrangler Jeans: Women's Crosshatch FRW10CH Flame Resistant Work Jeans is being added to your cart.